As a reward for loyalty, government-owned companies, or public sector undertakings (PSUs), are increasingly settling for gifts of gold coins, instead of cash. These coins are of varying weights, starting from 10g. At present gold is trading at Rs10,000 per 10g. Leading the rush are companies such as Oil and Natural Gas Corp. (ONGC), Indian Oil Corp. (IOC), Power Grid Corp. of India Ltd (PGCIL) and NTPC Ltd, which between them employ 85,000 people. This is similar to the practice pursued by IOC wherein it distributes coins of 5g, 10g and 20g to employees completing 15 years, 25 years and 30 years of service, respectively; Bharat Petroleum Corp. Ltd (BPCL), with an employee strength of 14,300, also has a policy of gifting 5g, 10g and 15g gold coins to its employees completing 15 years, 20 years and 25 years of service. “Earlier, we used to gift watches. We introduced the coins in 2000 as we found them a better alternative," a BPCL spokesperson said. Employees, no doubt, are pleased. An employee at PFC, who did not wish to be identified said: “It feels nice to receive it. If you get more and more such goodies you feel more committed. This also has increased our expectations." The key to this new trend, experts aver, is the fact that unlike cash incentives, gifts of gold coins do not attract a tax liability for the employee. The employer, however, does suffer a tax incidence in terms of the fringe benefit tax (FBT). “If I give my employees remuneration or gifts in terms of cash it gets taxed at their end. Gold coins are a better alternative," the chairman and managing director of a PSU, who did not wish to be identified, said. “When cash is given as a form of incentive it becomes part of his income. As a result, the employee has to pay tax on the amount of cash given. 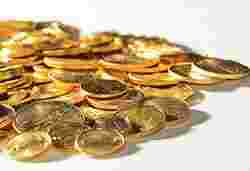 However, in case of gold coin it becomes a gift, and hence, the employee does not have to pay tax. However, the employer is taxed under the fringe benefit tax," said Ved Jain, a New Delhi-based tax expert. Since fringe benefit tax will be on half the value of the gift item, it makes more sense than offering a cash incentive. According to Jain, if Rs1,000 is given as a cash incentive and if the employee falls in the 30% income bracket he will have to pay Rs300 as income tax. But, if a gift item is given of an equivalent sum, the taxable component will be 50%, or Rs500 in this case. At 30% FBT the tax incidence for the employer will work out to Rs150. The flip side of this trend is that it is proving to be good business for companies and banks such as Minerals and Metals Trading Corp. (MMTC), State Bank of India (SBI), ICICI and Kotak Mahindra Bank. “Gold coin selling by banks has been on a rise and forms an important part of the gold investments. While jewellery is for consumption, gold coins are for investment. PSUs are an important customer source on the back of their employee strength," K.V.S. Manian, group head, retail liabilities and branch banking, Kotak Mahindra Bank, said. Attracted by the growing opportunities, Reliance Money, an Anil Dhirubhai Ambani Group company, entered the gold coin retail market early this year. A Reliance Money spokesperson said: “PSUs are and will be a very important part of the institutional purchase for gold coins." The Indian gold market, the largest in the world, is estimated at around 800 tonnes a year, of which the gold coin market is around 80 tonnes; of this, the size of the branded gold coin market is about 5%. Adarsh Goyal, director, marketing at MMTC, said: “One of our largest orders—of one lakh gold coins—came from Life Insurance Corp. around six months back, which we won through a tender process." The company is India’s premier bullion trader, handling more than 100 million tonnes (mt) of gold and 500mt of silver.